"MISS BEEHAVEN" is the perfect cabin for honeymooners, anniversaries and just reconnecting with the one you love. This one bedroom cabin has all the amenities of home and much more. The king size bed is surrounded by beautiful cabin decor that includes black bears and primitive accents. Gas fireplace that gives the cabin a rustic feel as you can enjoy a good movie in the DVD player provided or your favorite football game on the flat screen TV. The kitchen is fully equipped with all the necessary appliances to create your favorite meal. The cabin has a washer and dryer for your use. The open back deck offers such peace as you wake up and enjoy your coffee looking out over the beautiful wooded setting. Sitting in the wooden rockers, grilling on the gas grill and spending time in the screened in porch with a hot tub to relax or unwind after a busy day of adventure. If fishing is your forte..."Miss BeeHaven" is privately owned lake located in the resort. All roads leading to the cabin are paved. If you are looking to relax, reconnect or rejuvenate, "Miss BeeHaven" is the perfect cabin for you. We were actively looking to purchase a "home away from home" in the Smokies for several years. We did not intend to purchase a cabin to rent, but when we saw this quaint cabin, we feel in love with it and wanted to share our cabin with others so they too, could make memories and love it as much as we do. We chose this area because of its beauty and tranquility and also because of its many attractions and great restaurants. The close proximity to the Great Smoky Mountain National Park and Cades Cove was an added plus. Our Cabin is unique in its decor, and has a warm and cozy feeling. Imagine staying where you feel secluded, yet minutes away from all the great activities the area has to offer. If you enjoy fishing, the lake is a couple minutes from the cabin. Relax in the hot tub on the deck or just rock away your stress and worries in the rocking chairs. Enjoy Miss Beehaven!! The black bear decor in the bathroom is beautiful. Full shower with a separate Jacuzzi tub in the bath room with a large vanity and mirror. Plenty of space for your personal belongings. "Miss BeeHaven" is located in a wooded setting on Hidden Mountain West. Pines and hardwood trees surround the private back deck of this beautiful cabin. Winter view of Bluff Mountain. Full size, well equipped kitchen with all needed appliances and utensils to prepare full meals. Really cute too !!! Beautiful wooded view from the back deck. Wooden rockers compliment the deck as you plan your day or unwind from a busy day in the Great Smoky Mountains. Outdoor hot tub located on the back deck for privacy. Message therapy is available through a local business if interested. They will come to the cabin to perform couple or single messages for their rate per hour. Wonderful hosts for a cozy cabin! My husband and I really enjoyed our stay at together forever cabin, and hope to visit again. We will definitely tell our friends and family. I was in town to visit family in Wears Valley, and the cabin was a short 15 minutes away. Very convenient. The cabin is warm and comfortable with a nice woodsy view from the back deck. The hot tub was also nice and clean. I met Mickey when I checked in and we had a great visit. Nice and friendly folks. I recommend this or any of the cabins that Mickey and Tonjia manage/own. Thanks Mickey!! The property was clean, comfortable, and cozy. The managers made sure that we were well cared for. A most enjoyable stay! We loved the cabin and it was very cute and cozy. Hopefully we can plan a trip back sometime. Once again Tonjia and Mickey made our entire stay welcoming, clean, and comfortable. The cabins they run are always spotless of any type of grime. The decor of the bears and outdoors are so cute and inviting. The cabin was stocked with everything we could want or need. And if we needed anything at all Tonjia and Mickey are just a stones throw away and the make sure you know you can call for ANYTHING. 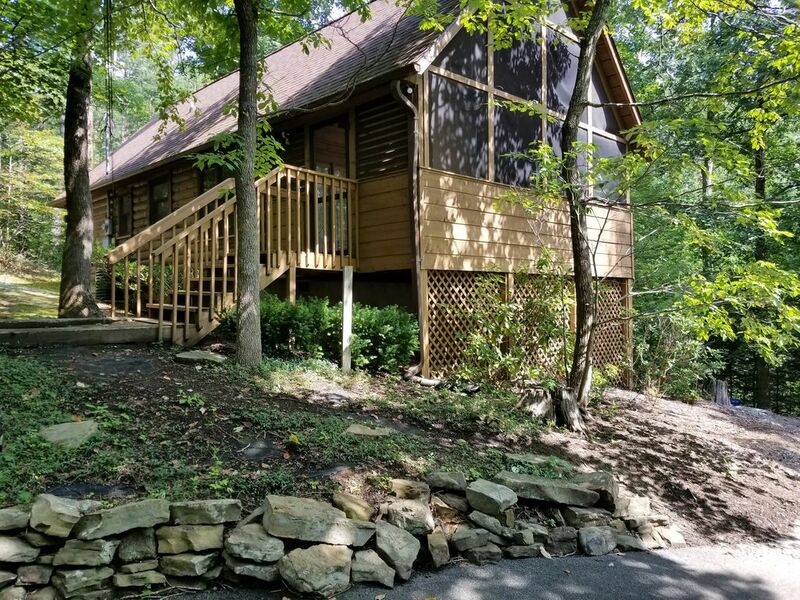 We absolutely cannot wait to be back in TN (hopefully permamently) but whether for a week or for weekend getaways Tonjia and Mickeys cabins are a must! The Great Smoky Mountains offers so much for travelers to enjoy. Cades Cove is an exceptional place to see wildlife and learn about the traditions from the first settlers of The Great Smoky Mountains. For example, black bears, deer and turkey can be seen at Cades Cove while touring the old churches and cabins these first settlers built themselves. The Great Smoky Mountains has over 800 miles of hiking trails and quiet walks for your family to enjoy. Pigeon Forge and Gatlinburg has plenty of outlet shopping and fun for the entire family. Dinner shows, go carts, putt putt golf, Dollywood amusement park and Splash Country water park just to name a few. Pigeon Forge offers many great restaurants for your dining pleasure. Downtown Gatlinburg is located within 15 minutes from Pigeon Forge for other shopping and dining options. If you are looking for that unusual gift, Gatlinburg is the place to find it. Take some time and enjoy the Great Smoky Mountains National Park. There you will find over 800 miles of hiking trails, many with beautiful waterfalls, wildlife and breathtaking mountain views. Take a picnic basket and enjoy an afternoon at one of the several picnic locations available in the park. This area offers several scenic drives, winery tours and you can even taste some real moonshine at the many distillers located around the area.